The painted turtle is just one of nature’s beautiful reptiles. The construction paper body of our turtle is sandwiched between two CDs that form the shells. Our little hanging turtle has assorted sequins attached with glitter glue on one side; and is decorated with colored paper bits on the opposite side. Find the directions for, “Hanging CD Turtle,” in the 2nd Grade Projects Gallery in the sidebar. 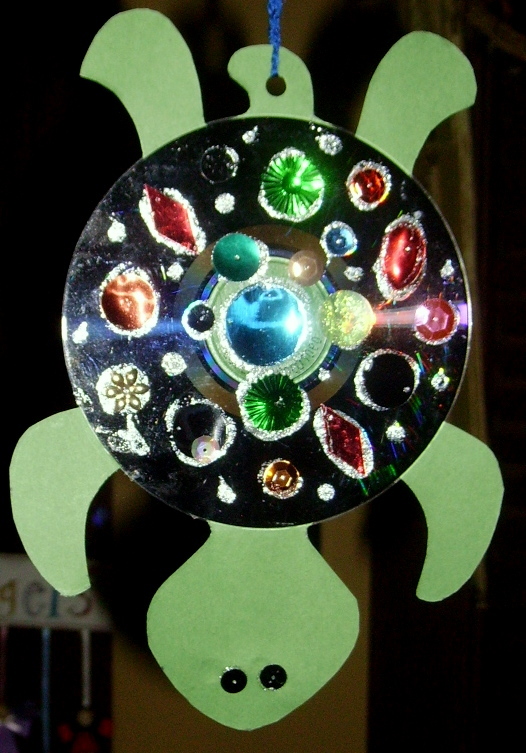 This entry was posted in 2nd Grade and tagged 2nd Grade, arts and crafts for kids, cd projects for kids, easy crafts for kids, hanging cd crafts for kids, hanging cd turtle, hanging turtle, jeweled turtle, painted turtle, turtle cd hanging craft. Bookmark the permalink.